During the Art City White Night, a special event within “Arte Fiera. 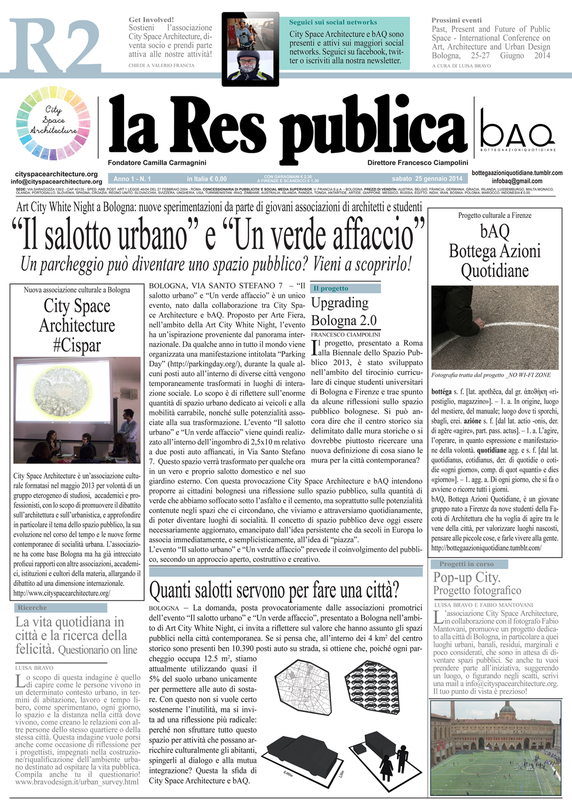 International Fair of Modern and Contemporary Art”, on January 25, 2014, we presented [The urban lounge and a green view], a collaborative project developed with bAQ, a young group created in Florence by several students from the Faculty of Architecture. Our installation took place in Via Santo Stefano 7, in the urban core of the city of Bologna, close to the Leaning Towers, within the footprint of 2.5 by 10 meters of two parking spots. From 6:00 pm to midnight we transformed a small outdooor space into a private/public domestic living room and its garden. We met many citizens from Bologna and had a fun and pleasant time with them and with our friends, sitting on the sofa or surrounded by the nature. They all shared our vision of a road made for people to meet and socialize, with a very positive attitude and a friendly interest. Thanks you all! [The urban lounge and a green view] is a collaborative event promoted by City Space Architecture together with bAQ, a young group created in Florence by several students from the Faculty of Architecture, with the purpose of acting from the inside heart of the city, exploiting hidden places and establishing an everyday interaction with urban residents and users. [The urban lounge and a green view] event has been organized for “Arte Fiera. International fair of Modern and Contemporary Art” as a part of the Art City White Night and will take place on January 25, 2014. It has been inspired by the worldwide famous "Parking Day", intended to transform certain parking spots into places of social interaction, highlighting the potential associated to their transformation. Last November 9, 2013 our "Past present and future of public space" international research project was presented in a public symposium and exhibition at the Quartiere San Vitale, Municipality of Bologna. Students from University of Bologna and University of Florence discussed about public space referring mainly to the city of Bologna, presenting results from research activities. Using provocative images and a conceptual approach, they tried to establish a new perception of the public realm, both for the historic centre and the suburb. By twinning central and peripheral public spaces, mixing their functions and enhancing their potentialities through a network of urban sequences, they tried to underline similarities and differences between different places, thus suggesting new ways through which they could benefit each one with another. An urban regeneration strategy for the Via Emilia, the territorial public space backbone, was presented. Working on a lighter, quicker, cheaper approach, suggesting simple improvements of places, proposing a large involvement of residents, associations and ordinary people as main performers in the design and transformation process, the project develops a new vision for this 12 Km long public space as a means for reconnecting citizens to public life, in the city centre and suburbs. Invited speakers from University of Bologna presented different research projects, currently underway, related to art (Pop-up city) and technology (Hic svnt leones) as tools to describe embedded values in the contemporary public realm. A final round table with scholars, public administrators and professionals opened a discussion about the role of architects and planners in those processes that transform places in which we live every day. How to design or regenerate spaces able to attract people and promote vibrant activities? A new awareness and cultural knowledge of the contemporary city needs to be established, referring to the urban and suburban contexts as part of the same whole, where opportunities can be shared in order to achieve a common good. Next Saturday, November 9, 2013 in Bologna a symposium and exhibition from our "Past present and future of public space" international project will take place at the Quartiere San Vitale, in vicolo Bolognetti 2, Sala Silentium, 10am. Look at the map to know where the place is. 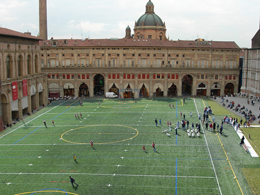 Bologna and its public spaces will be the main subject of the discussion. Students from University of Bologna and from University of Florence will present and exhibit results of research activities and of a graduation master thesis, scholars from University of Bologna will offer a preview of multidisciplinar research initiatives regarding contemporary issues of public space, through art and technology. A round table discussion will involve academics, public administrators, architects and urban designers, in order to share different point of views and perspectives. The event is developed under the patronage of the Quartiere San Vitale, Municipality of Bologna and the Department of Architecture, University of Bologna. At the Biennale dello spazio pubblico in Rome (May 2013, 16-18) our working team presented research and activities developed during past months related to the project "Past present and future of public space", in collaboration with international scholars. In Rome a call for proposals has been launched, intended to invite scholars, architects, urban designers, planners, photographers and artists to join the project, submitting papers and materials related to the main 4 themes, choosing between 16 topics. The deadline for abstract proposal is 4 November 2013 -> EXTENDED 20 December 2013.